The software development life cycle is complex, frequently involving many functional teams internal and external to an organisation, a variety of processes, tools and technologies in order to produce a software solution that meets the business need. To consistently deliver software effectively on time, on budget and meeting business needs, all aspects of the people, process and tools need to work together efficiently. Regardless of how good the individual areas of people, process and tools have been addressed, it is always a challenge to keep them working consistently in harmony. Is it any wonder that due to the complexity of software development projects they are more likely to be impacted by the typical project delivery issues? Whether you require help introducing the whole agile software development framework or just aspects of it such as development practices, we can help. 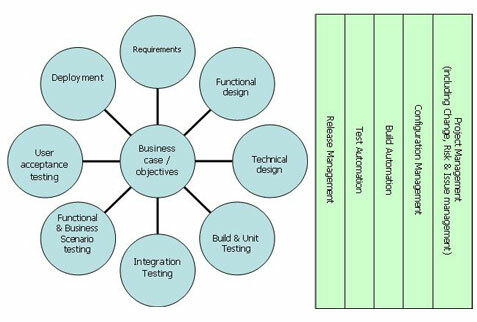 We can also help apply our expertise and experience to support improvements in waterfall software development approach. Our aim is to help you transform your software development approach and project delivery to give your organisation the ability to consistently deliver effectively and meet business needs. We work collaboratively to help you implement the whole proven agile project delivery framework or focus on key aspects that need to be addressed now. Whatever the scope of work required we can be adapt our approach and the framework to meet the needs of your organisation. We can adapt our approach from the smallest company to large organisations that expect comprehensive governance as part of IT delivery.